Innumerable pieces of fiction include mummies as antagonists. From Karl Freund's 1932 classic The Mummy and on to more contemporary titles. Today's Encounter Table entry is inspired by one specific fictional mummy, Akmodan II, from the classic horror-inspired video game Castlevania. In Castlevania, Akmodan II is but one of Dracula's many undead servants standing in the way the game's protagonist on their way to slay the king of vampires. 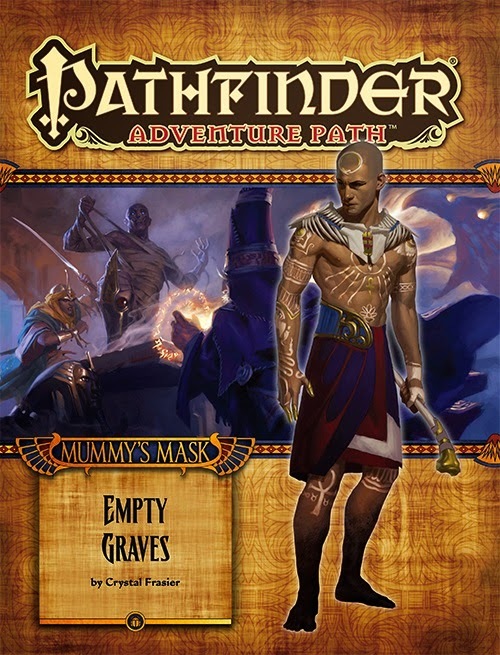 With Paizo's The Mummy's Mask Adventure Path moving into Part 2 this month, I thought I'd offer up a variant of the traditional mummy found in Pathfinder based loosely on Akmodan's incarnations throughout Castlevania history along with some unique twists on mummy lore garnered from across popular fiction. This entry includes a bestiary entry for a mummy lord, as well as the mummy lord template. If you use this undead antagonist in your Pathfinder games, let us know how in the comments! Before Combat Akmodan II casts freedom of movement. During Combat Akmodan II relies on offensive spells, or on channel energy if he has undead allies. He will attempt to grapple spellcasters with his choking bandages. Aura of Awe (Su) Creatures of less than 5 HD in a 60-foot radius that look at Akmodan II must succeed on a Will save or gain the cowering condition until they are no longer within 60 feet of Akmodan II. Creatures with 5 HD or more must succeed at a Will save or be shaken for 15 rounds. A creature that successfully saves cannot be affected again by Akmodan II's aura for 24 hours. This is a mind-affecting fear effect. Choking Wrappings (Su) A creature successfully grappled by Akmodan II's wrappings must succeed on a Fortitude save or begin suffocating. Among the ancient dead of Osirion, the mummy is most recognizable as an iconic form of risen corpse. Some are created to serve as guardians, manufactured from the bodies of servants belonging to the pharaohs of old. Others are created spontaneously from the corpses of those who die in the vast deserts, dried out into crumbling corpses under the scalding hot sun. Some seek the path of mummification prior to death, not as servants, but rather as sovereigns. Rare pharaohs of Ancient Osirion would willingly undergo a process by which they were horrifyingly — and painfully — mummified while alive. This process bound the pharaoh's soul not to his corporeal shell, but to his sarcophagus, and allowed it to inhabit his decayed form as a vessel by which he could continue his rule in this life and the next. Abominations of the natural cycle, mummy lords possess tremendous power and vast cruelty. “Mummy Lord” is an acquired template that can be added to any living creature (referred to hereafter as the base creature). A mummy lord retains all the base creature's statistics and special abilities except as noted here. Type: The creature's type changes to undead. Do not recalculate BAB, saves, or skill ranks. Senses: A mummy lord gains darkvision 60 ft.
Armor Class: A mummy lord has a +5 natural armor bonus or the base creature's natural armor bonus, whichever is better. Hit Dice: Change all of the creature's racial Hit Dice to d8s. All Hit Dice derived from class levels remain unchanged. As undead, mummy lords use their Charisma modifiers to determine bonus hit points (instead of Constitution). Defensive Abilities: A mummy lord gains channel resistance +4, DR 10/good, Spell Resistance versus divine magic equal to 10 + the mummy lord's HD, and is immune to all spells with a [curse] descriptor (in addition to those granted by its undead traits). The mummy lord also gains the following defensive ability. When a mummy lord is destroyed, its soul is instantly returned to its sarcophagus (which is generally hidden by the mummy lord in a safe place, under guard). While its soul is disembodied and contained in its sarcophagus, the mummy lord can perceive the world around its sarcophagus out to 60 feet but cannot take any actions except for speech. The mummy lord's voice is hollow and disembodied and seems to emanate from the sarcophagus. If a creature touches the mummy lord's sarcophagus, the mummy lord may cast any spel with a range of touch (provided the mummy lord had spells remaining when it was destroyed) on the creature. If a living creature is placed in the mummy lord's sarcophagus while the mummy lord's soul inhabits it, the creature must immediately make a Will save (DC 10 + 1/2 the mummy lord's HD + the mummy lord's Charisma modifier) or become possessed by the mummy lord's spirit. This ability is similar to a //magic jar// spell (caster level 10th or the mummy lord's Hit Dice, whichever is higher), except that it does not require a receptacle. A creature that successfully saves is immune to that mummy lord's entombed soul ability for 24 hours. If the creature fails its save the mummy lord now inhabits the creature's body but neither the mummy lord or its new host are capable of taking any actions. Furthermore, the mummy lord loses its ability to see and hear around its sarcophagus and its ability to deliver touch spells through the sarcophagus. For each day the mummy lord possesses a creature in this manner, the host takes 1d6 points of Con damage as its body rapidly decays from the inside out. When the possessed creature's Con score reaches 0, it dies. Immediately upon death of the possessed host creature, the mummy lord is restored to full health and regains any uses of abilities it had as if it had received a full 8 hours of rest. Creatures slain by a mummy lord's entombed soul ability may not be raised or resurrected until the mummy lord is destroyed. The newly reborn mummy lord retains its mental ability scores, class levels, skills, feats, and other level-dependent abilities in addition to the abilities granted by the mummy lord template. However, it now uses the physical ability scores and racial abilities of its new body. In this new state the mummy lord no longer resembles itself, but a decayed version of its new host body. However, the mummy lord and host body are now one, and spells or abilities that expel possessing entities have no effect on it. Weaknesses: A mummy lord is vulnerable to fire. Melee: A mummy lord gains a slam attack if the base creature didn't have one. Damage for the slam depends on the mummy lord's size as if it were two size categories larger. Its slam also inflicts mummy rot. Additionally, a mummy lord gains 6 slam attacks with its animated burial wrappings. These attacks have a reach equal to double the mummy's normal reach and have the grab and constrict abilities. Creatures grappled by the mummy lord's wrappings are subjected to its choking wrappings ability listed below. All of a mummy lord's slam attacks bypass damage reduction as if they were magic weapons. Special Attacks: A mummy lord gains the two special attacks described below. Save DCs are equal to 10 + 1/2 mummy lord's HD + mummy lord's Cha modifier unless otherwise noted. Creatures of less than 5 HD in a 60-foot radius that look at the mummy lord must succeed on a Will save or gain the cowering condition until they are no longer within 60 feet of the mummy lord. Creatures with 5 HD or more must succeed at a Will save or be shaken for a number of rounds equal to the mummy lord's Hit Dice. A creature that successfully saves cannot be affected again by the same mummy lord's aura for 24 hours. This is a mind-affecting fear effect. A mummy's lord maintains a supernatural control over its burial wrappings as if they were an extension of its body. This ability grants a mummy lord six natural attacks that deal slam damage and have double the mummy lord's natural reach. A creature successfully grappled by a mummy lord's living wrapping attack must succeed on a Fortitude save or begin suffocating as it is choked by the wrappings in addition to taking constrict damage. Abilities: Str +6, Wis +2, Cha +2. Being undead, a mummy lord has no Constitution score. Skills: Mummy lords have a +8 racial bonus on Perception and Sense Motive checks. A mummy lord always treats Intimidate, Knowledge (religion), Perception, Sense Motive, and Spellcraft as class skills. Otherwise, skills are the same as the base creature. An integral part of becoming a mummy lord is the creation of the sarcophagus in which the character stores his soul when not in possession of a body. The only way to get rid of a mummy lord for sure is to destroy its sarcophagus. Unless its sarcophagus is located and destroyed, a mummy lord can be reborn in a new host body after it is killed. Each mummy lord must create its own sarcophagus by using the Craft Wondrous Item feat. The character must be able to cast spells and have a caster level of 10th or higher. The sarcophagus costs 100,000 gp to create and has a caster level equal to that of its creator at the time of creation. If the mummy lord's sarcophagus is destroyed while it is still inhabiting a body, the mummy lord knows immediately. It must begin then build a new sarcophagus, or else the next time it is killed its soul is destroyed. A mummy lord may only have one sarcophagus at a time. If the sarcophagus is destroyed while its soul is trapped within, the mummy lord is destroyed along with it. A typical mummy lord's sarcophagus is made of stone and has 200hp and a hardness of 10.